I'm the first to admit that if there's ever an excuse to go out for breakfast I'll take it. Sunday sleep in, no milk, no gluten free bread in the house, no oil to fry the bacon and eggs, "...but hun , I just don't feel like cooking breakfast....so lets...ummm...go out" insert insane looking cheeky grin here. I've also been known to meet up with girlfriends purely to walk to a breakfast spot, indulge and then walk home, cos what's better than walking off your bacon and eggs before you've even eaten them?! ...and all that without even getting me started on the coffee...oh the delicious, thick crema and the heady, strong espresso aroma that fills breakfast joints is enough of an excuse on it's own if you ask me! However, I digress, this is a cooking and baking blog is it not? So, I should share that yes, every now and then I also make breakfast; cheesy scrambled eggs, baked eggs , baked beans or hashbrowns , yep I love breakfast. On the upside - yes there is one, if you're still here?!? 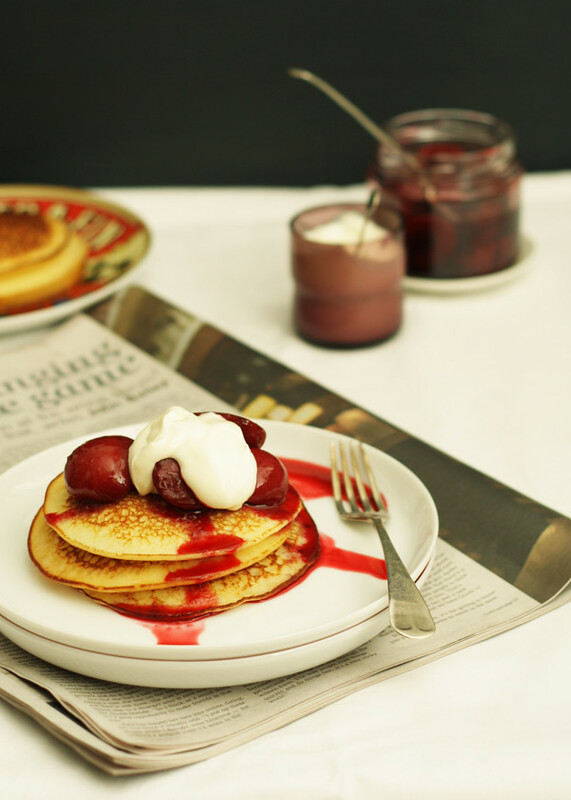 - these gluten free ricotta pancakes are, thankfully, not at all green, nor raw and although the addition of 100's and 1000's would be quite pretty, I find the addition would be just too crunchy to go with the slightly sour stewed plums and rich double cream that I've chosen to top these golden rounds with. Perfect for your weekend breakfast, at 8am or 1.30pm - who cares - it's pancakes and I ate them all! The ingredients for these pancakes were kindly supplied to me on behalf of Coeliac Awareness Week, this March 13th - 20th 2012, which aims to raise the awareness of Coeliac Disease (CD) and the need to get tested for CD. 1 in 100 Australians suffer from CD, yet 75percent remain undiagnosed. I urge you, don't take as long as I did to get tested, as when you've got an answer and a way forward you don't need to wonder anymore about why you're falling sleeping at your desk after lunch every day, have no energy and are unhealthy, pale as a weak soy, decaf latte and your nails are constantly breaking, you can take that way forward and turn yourself back into a healthy person. In the spirit of Coeliac Awareness Week, I thought I'd also take this opportunity to list a few upcoming Gluten Free events happening around Australia in 2012, I might even see you at one of them! In a medium bowl whisk together the eggs, ricotta, oil and milk until smooth. Stir in the remaining ingredients and mix til smooth. Heat a large frypan and grease with a small knob of butter (about 1/2tsp) till quite hot, pour a ladleful of pancake batter onto the frypan and cook. You'll need to reduce the temperature to about medium at this stage, you don't want crunchy pancakes! You want little bubbles to appear in the top of the pancake, that's when it's ready to flip, so flip it over and cook it for another 30seconds to a minute. Transfer to a warmed plate and cover. Repeat with remaining pancake mixture, regreasing your pan every couple of pancakes. Place plums, sugar and 60ml water in a heavy based saucepan and bring to a simmer over medium heat. Simmer for 8-12minutes until softened and allow to cool. 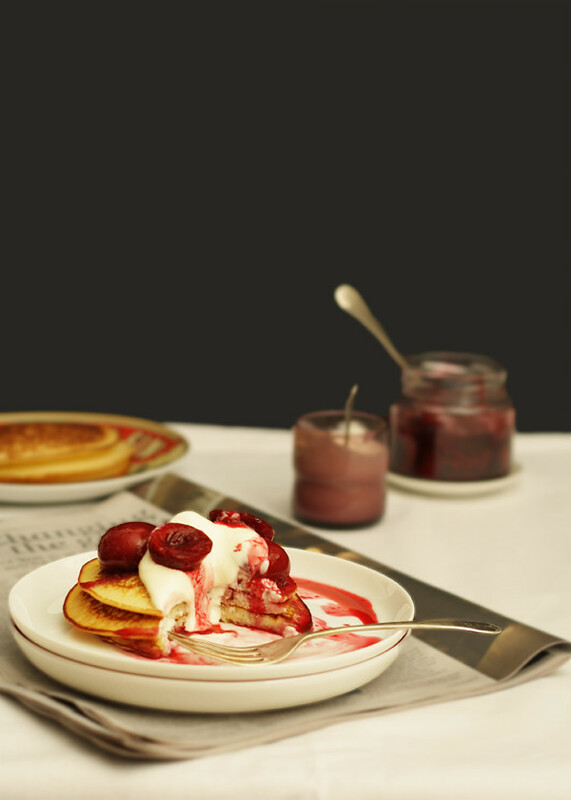 Serve warm over the gluten free ricotta pancakes with a dollop or two of double cream or a creamy gluten free vanilla yoghurt. Best enjoyed with a clear conciences when one should be eating lunch.